We Manek Ratna, began our operations in the year 2010 as a fine manufacturer, supplier, wholesaler and trader of this commendable range of Jewelery & Religious Idols. 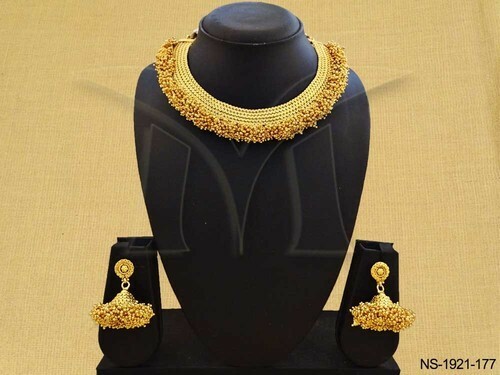 Our highly admirable range is comprised of Kundan Jewellery, Religious Jewellery and Coin Sets Jewellery. For the purpose of providing maximum satisfaction, we indulge in using of the finest raw materials and modern tools. Owing to this and our highly skilled professionals, the offered product has a superior shine, fine finishing and an attractive design. Further, the offered range marked at the best rate possible, makes it one of the finest that is available in the market. At Manek Ratna, we have a highly equipped and evolved state-of-the-art infrastructural facility. The facility is widely praised for the superior efficiency and ease it provides in achieving of various goals and objectives. For the purpose of attainment of superior and finer management, the facility has been divided into several units, lead by some of our most experienced and skilled professionals. These units work with unity in a dedicated manner to boost productivity and standardize quality. In addition, our ethical working habits and abidance of the industry guidelines, has helped us generate a huge client base.